• The synch speed, or synchronous speed, is the speed of the wheel at which the electromagnetic torque defined below, is zero. 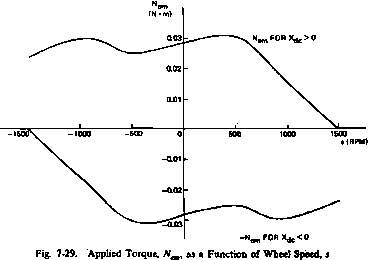 f The torque applied to an induction motor is proportional to the square of the applied voltage. The drive electronics includes a square root circuit so that the applied torque is proportional to the control voltage. The duty cycle as used in Eq. (7-144) and Fig. 7-28 is actually the squared input to the wheel. The nonlinearity of the function graphed in Fig. 7-28 near is due to the fact that the mathematical square foot function has infinite slope at the origin, which can be modeled only approximately in the wheel drive electronics package. 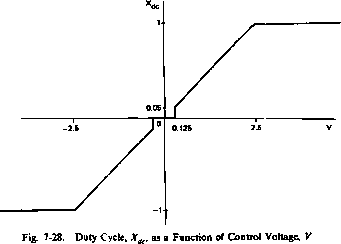 For a negative duty cycle, the phase relation between the signals applied to the two phases of the wheel is reversed. For the IUE wheel, the Coulomb friction coefficient is Nc = 7.06x 10 4 N-m, and the viscous friction coefficient is/= 1.21 X 10"6 N m/rpm. A considerably more sophisticated friction model developed by Dahl  can be used where the simple model described above is inadequate. The Dahl model is a statistical model of friction as the random making and breaking of bonds between solid surfaces. It includes "stictionthe increased friction found when the relative velocity between the sliding surfaces is zero. A mathematical model of a gas-jet control system is used to predict the spacecraft response when a given set of commands is input to the control system. This prediction may be used for simulation, for refinement of initial estimates when computing commands, or for comparison with the actual spacecraft response^ during or after the execution of a command. The main factors modeled in a gas-jet system are (1) the thrust profile, or time-dependence of the jet thrust relative to the commanded on and off times, and (2) the alignment of the thruster in the spacecraft body coordinate system. Both factors are ordinarily measured before launch. However, the measured thrust profile may be erroneous if the thrust vector does not lie along the thruster symmetry axis or if launch vibration affects the alignment. Consequently, inflight calibration, discussed in Section 19.3, may be desirable if several maneuvers must be performed and the fuel budget is tight. Several additional effects may be considered, although in most cases they will be negligible. These are the change in spin rate resulting from the conservation of angular momentum as propellant flows from storage tanks to thrusters, and the change in center of mass and moments of inertia as propellant is consumed. These effects can be easily estimated given the geometry of the tanks and thrusters and the propellant flow rate. The major uncertainty is in the distribution of the propellant within the tanks. Thrust Profile. A hypothetical thrust profile is shown in Fig. 7-30. The commanded start time is /0; the thrust begins buildup at /, and reaches a steady state at t2; the commanded stop time is t3; the thrust begins to decay at /4 and reaches zero at ts. The delays between t0 and /, and between t3 and t4 are due to electrical and mechanical delays in the valve circuits and to the time for the propellant to flow from the valves to the thrusters. The intervals from f, to /2 and from f4 to /5 are the rise and fall times, respectively; these are nonzero because of the time required to establish steady-state propellant flow and (for hot-gas systems) reaction rate in the thruster. 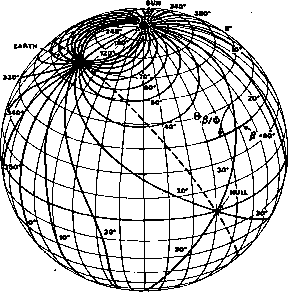 The exact shape of the buildup and decay does not follow any well-established law; Fig. 7-30 is descriptive rather than quantitative. The thrust may not even reach steady state if very short pulses are commanded. Typical values for delays and rise and fall times range from a few milliseconds to a few hundred milliseconds. For example, Werking, el al.,  cite a fall time of 300 ms for the cold-gas thrusters on RAE-2, whereas a rise time of 10 ms can be inferred from measurements on 0.4 N thrusters for the hot-gas IUE system [Sansevero and Simmons 1975]. Sansevero also reports a delay time of 5 to 15 ms for opening and closing solenoid valves in the latter system. In both hot-gas and cold-gas systems, the peak force increases with increasing propellant flow rate. In cold-gas systems, a pressure regulator is ordinarily used to maintain a constant flow rate and, hence, peak force as long as the propellant supply pressure remains above the regulator output pressure. If the pressure is not regulated, the flow rate will depend on individual system characteristics, but will drop as propellant is consumed and the supply pressure drops. In hydrazinei-fueled systems, the flow rate of the propellant, which is a liquid, is not regulated. In these systems, the peak force is measured at various supply pressures so that thruster performance may be predicted over the entire range of pressures which will be encountered during the mission. The pressure dependence of the force is sometimes described in a parametric form suitable for the thruster model. Otherwise, the model must use interpolation between calibration points to predict thruster performance.